Comments: Imperial sandtroopers are specially trained and equipped to withstand harsh desert envirnments. Like all stormtroopers, sandtroopers are completely loyal to the Emperor and do his bidding without question. Sandtroopers go to the desert planet Tatooine in their search for the escaped droids R2-D2 and C-3PO. 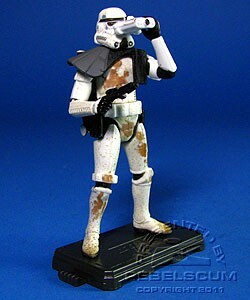 This Sandtrooper (Tatooine Search) figure is a repack of 2001's POTJ Sandtrooper (Tatooine Patrol).